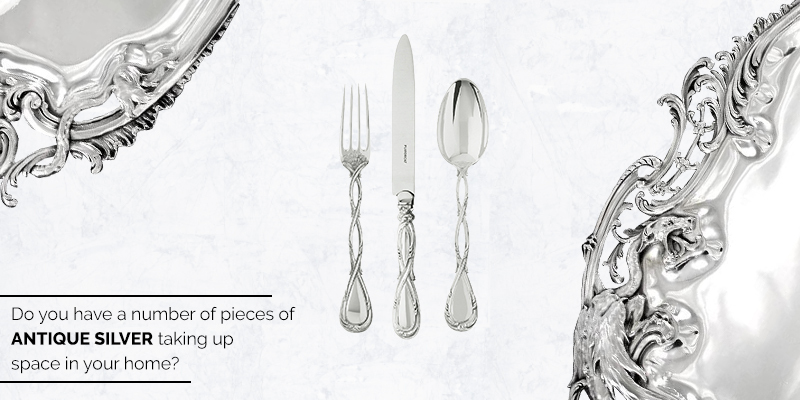 Do you have a number of pieces of antique silver taking up space in your home? If you’ve decided that you’ll never have a use for your silver, it might be time to consider selling it. Are you now wondering what to do next when it comes to selling Antique Silver at best price? Before you can cash your check, you have to make certain what you have is actually worth money. That’s where you need us and our team of experienced antique silver buyers & appraisers. Once you decide to sell, contact William smith Antiques that brings over 40 years of experience buying estate sterling silver & antique silver in Connecticut, New York & Now Arizona to the table. We are specialists in assessing antique silver and pay the best prices. If you can’t visit us, then send us an email at Bill@wsmithauction.com that contains a detailed description and photographs of the item you would like to sell. Antique silver bowls, trays and platters look gorgeous. People love how silver reflects the light and how etched designs jump out of its surface. There are no other metals that look exactly like silver. It’s this look that antique silver buyers want. However, these buyers are looking for pieces that have history and are true antiques, not something that’s simply silver in color only. That’s why appraisals are necessary. Antique Silver pieces will always be in demand; that being said a well kept and maintained piece can fetch a handsome price and we offer the best prices for all antique silver wares. How do we Offer The Best Prices For Antique Silverware? We have 40+ years of experience in buying & appraising antique silver. Whether you have a silver tea set that belonged to your grandmother or have decided to sell your entire silver collection, we can assist you in determining its value. If you’re looking to sell sterling including Tiffany, Cartier, Gorham, George Jensen, and other antique pieces, you’ve come to the right place. As one of the trusted antique silver buyers in the Connecticut, New York & Now Arizona area, once we make a purchase we sometimes sell silver pieces to our long standing clientele of collectors and connoisseurs through Auctions thereby offering the best prices for Antique Silver. We ensure careful examination of every piece and our auctions offer only the most outstanding antique silver items. The only way to truly know the worth of an antique is through an expert’s appraisal and with our decades of experience you are in great hands. What Antique Silver Items fetch the best price? If you’re new to dealing in antique silver, you may not realize how many different types of pieces are out there. In addition to silverware, trays, and tea sets, there are also silver centrepieces, candlesticks, jugs, vases, coins, picture frames, costume jewelry, and pitchers. If your pieces are sterling silver and not plated, you can get a very good price for selling them. Even if they’re silver plated, if they’re in excellent condition, you can still sell them for a nice amount. We buy mostly all antique silver items at the best prices and our years of experience makes us great at when it comes to anything antique silver. Ready to Enter the World of Antique Silver Buying and Selling? If you’re ready to start collecting antique silver pieces or have a few you’d like to part with, there’s no time like the present. Silver is more popular now than ever, and with our leading appraisal experts and auctioneers by your side, there’s never been a better time to start exploring this world. We are the Trusted Antique Silver Buyers/Dealers in New York, Connecticut & Now Arizona. If you are looking to sell your Antique Silver and the options to liquidating it. Call us today !! !